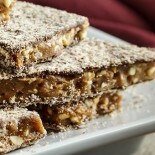 Buttery and crunchy with diced almonds, covered with milk chocolate and a layer of almond meal. Our trademark. 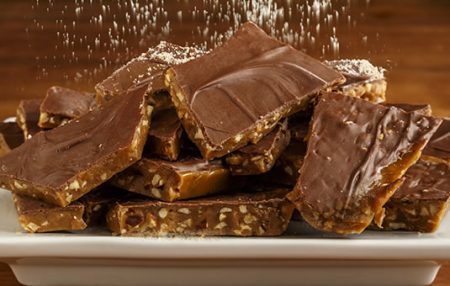 A delicious golden almond toffee made from sweet cream butter, sugar, and almonds, covered with a layer of chocolate and almond meal on each side. Ruth’s toffee is the absolutely best toffee on the planet, BAR NONE! Ruth is a confection genius! Dare I say, the Toffee Goddess! Thanks Ruth!!! We have been buying our toffee from Ruth for MANY years. It is by far the best I have ever eaten. We send it as corporate gifts and everyone looks forward to it year after year. I also LOVE the turtles. Thank you Ruth for making such fabulous products. I love giving your Toffee as the best homemade gifts for my corporate clients! Thank you Ruth! We received a box of Milk Chocolate Toffee from a client at work and everyone LOVED it!! I loved it so much, I’m ordering it to give away for Christmas gifts. My mother in law sent us a box of your toffee for Christmas and it’s THE BEST TOFFEE IN THE WORLD!! We will now be making Ruths toffee a family tradition in our home during the holiday and maybe year round lol I’m sure I will be craving this again soon!